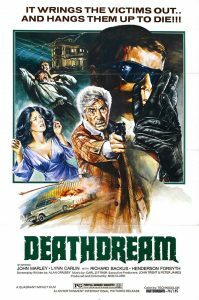 Though filmed in the early 1970s, Deathdream doesn’t come off as hopelessly dated. Its themes resonate strongly even today. As an allegory, the film makes its anti-war points bluntly. This war (thought it is never named it’s obviously Vietnam) is killing too many of our boys and making zombies out of the ones that make it home. But the movie is not generally anti-war — it manages to contrast Vietnam with WWII, represented as a good war (in the person and words of the mailman), where there was little doubt what we were doing was right and that our military forces were being led authoritatively to absolute victory. The same couldn’t be said for Vietnam, and by 1972, no one really remembered what we were fighting for anymore. Deathdream was filmed before Vietnam ended and released after, making its timing perfect. There are a few criticisms, hardly worth noting — some scenes are poorly staged and lighted, and Clark doesn’t always get the best out of his actors (and has little to work with in some cases). Early scenes are a bit stilted (Was the movie shot in sequence with the story? That might explain it), but the movie finds its groove at about the 30 minute mark. Don’t expect a slick production. It’s a small, claustrophobic, personal movie with rough edges to spare. Some scenes of violence are cartoonish and others are brutal. Also, the effects and makeup are much better than we have any right to expect. Poor, rotting Andy is a heck of a sight, and a sad sight in the scene where he is led down the stairs by his mother. Deathdream is an amazing accomplishment all things considered.